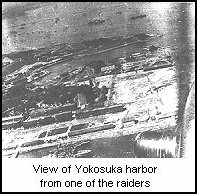 April 18, 1942 - Sixteen Army B-25 bombers struck Tokyo, Yokohama, Kobe and Nagoya Japan today. The attacks caused little physical damage to the Japanese home island, but the attack cause severe consternation in the Japanese military high command and other officials. It is felt that the blow was in large part responsible for the Japanese reducing their plans for continued expansion in the Pacific. Also, the Japanese diverted their limited resources to the occupation of Chekiang province in China in order to prevent this type of over flight mission from happening again. The raid was a major moral booster in America. This was some of the first really good news the country had received since the start of the war in December. When the press realized that the Army had no airfields in range of the B-25s to hit Japan, they asked Roosevelt where the planes came from. He said, “Shangri-La”. 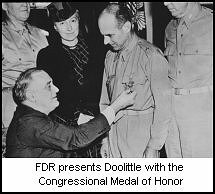 The Doolittle raid was one of the most bizarre if not daring stunts to be pulled in the war. James “Jimmy”. 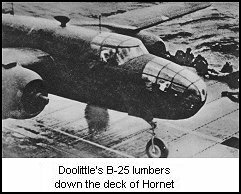 Doolittle took his flight of 16 B-25 Mitchell medium bombers and strapped them (literally) to the deck of the USS Hornet. The plan was to launch the bombers from the carrier, attack Japan and then make their way to friendly bases in China. Battling heavy seas and under the constant threat of discovery, the carrier and its cargo of Army bombers snuck deep into enemy controlled waters. 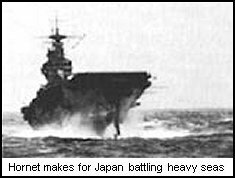 Just 10 hours from the scheduled launch, the task force was discovered by a Japanese surface ship. Radio operators intercepted messages radioed from the picket before the cruiser Nashville sunk the enemy. It was decided that the attack would go forward immediately even though the range would be to great to guarantee landing in friendly territory. 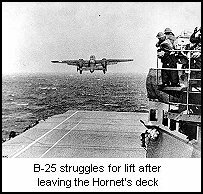 At 8:18 am, the first bomber lumbered down the deck of Hornet. 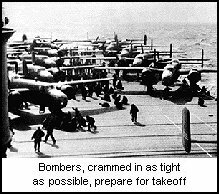 Normally, the B-25 needs 1200' for take-off, but Doolittle had only 435' of pitching deck to work with. His plane barely reached takeoff speed when the heavily loaded bomber disappeared under the lip of the deck, and just missed hitting the water before recovering and lumbering toward Japan. The other 15 planes followed suit during the next hour. Not wasting fuel to form up, the planes headed for their targets independently. Eight of the planes bombed their primary targets, while five hit secondaries. Some of the planes hit Tokyo during a practice air raid and the locals were extremely confused when real bombs started hitting the city. Favorable tail winds allowed most of the planes to make it to China. One plane landed in Vladivostok where the plane and crew were interned (The USSR and Japan would remain at peace until August 1945). Two planes came down in Japanese occupied China. Of the 8 crew members who survived to be captured, three were executed, 4 of the other 5 survived imprisonment and were released at the end of the war. The remaining planes made forced landings in friendly territory.